Review: I was intrigued to see the lovely bar from the window on South Street, but disappointed after walking up to the entrance to see that they did not yet have a liquor license. (Note: Since this review originally was published, Bluefin Bistro has obtained a liquor license and now has a fine wine list as well as a full stocked bar.) I figured I would check that out next time, but I don’t think I will be going again. 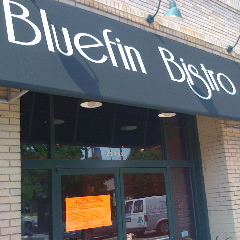 Bluefin Bistro was clean and quiet, and somewhat deserted for a lunch hour downtown. They had clever framed fish tanks on the walls by some of the tables, which could entertain while you wait for your food, or your coffee, or your drink refill, or your appetizer, or anything else you might ask for that takes an eternity to get to your table. The menu had lots of sushi, some typical bistro fare, and a variety of of seafood dishes. Prices are about $6.95 and up for lunch, with dinners going from $8.95 up to the $50 range. I was shocked when I got my bill to find out that the side salad the server had suggested with my sushi roll was a whopping $3.95! It was merely a cup of iceberg with a slice of tomato on it. For a just a bit more change, I could have gotten an entree salad. One of my friends ordered the scallops from the appetizer menu for all of us to share, but there were only two scallops on the plate. Not to mention, the scallops were brought out much later than the Lilliputian salads. We all ordered sushi, which was tasty; but it was delivered to the table at different times. One friend specified that she wanted a spicy sushi roll, and the server suggested a roll that had the word Spicy in the title (no kidding). I tasted it, and let me say, I have had spicier food at a bake sale. She asked for some spicy sauce to add to it, and after a little begging, was finally given a dish of the sauce they had used on my roll. To wrap up the meal, we ordered the Downtown Cheesecake, which was quite good and had an attractive presentation. Since the restaurant was very chilly, we ordered coffee to warm us up while we chatted, but it took more than five minutes to get to the table. To top off our wait, we had to ask for sweetener, as it was served with no accompaniments. While a sign did boast that they serve Starbucks coffee, it unfortunately tasted like instant. In hind sight, we should have just walked outside to warm up.